With the Canadian winter being as long as it is, many Canadian families take the opportunity for a short vacation when school takes a break mid-March. Depending on where you go or what you do, you may want to take the family dog along with you to join in the fun. Some dogs though, particularly the young, get car sick on long journeys, so what can be done to make their trip more comfortable? 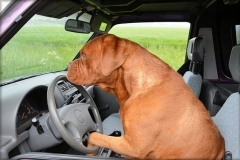 One cause for car sickness in dogs is the anxiety that accompanies a ride in the car. Help to alleviate this unease by getting them accustomed to being in the car first, and secondly taking short trips around the block frequently but with increasing distance. Once they know that a trip in the car is not a cause for concern or great excitement it can make a world of difference in their comfort levels. If your pet has trouble keeping their meals down when in the car, give them 2-3 hours between their last meal and the start of the journey. This can result in a calmer stomach and less mess in the car. If your dog is secured with a seat belt harness they will be inclined to face forward in the car. Open the windows to provide the flow of fresh air and keep them cool. Provide them with the odd treat or special car toy on the trip to improve comfort, but not too many treats or they may become more nauseous. There are many natural and safe over-the-counter options available for reducing motion-sickness in dogs that are available to you. To find out which options are right for your pet, ask your veterinarian. Under no circumstances should you give your dog a medication that was not prescribed for them by a veterinarian. For more suggestions on how to keep your dog comfortable during long trips in the car, contact your veterinarian today.